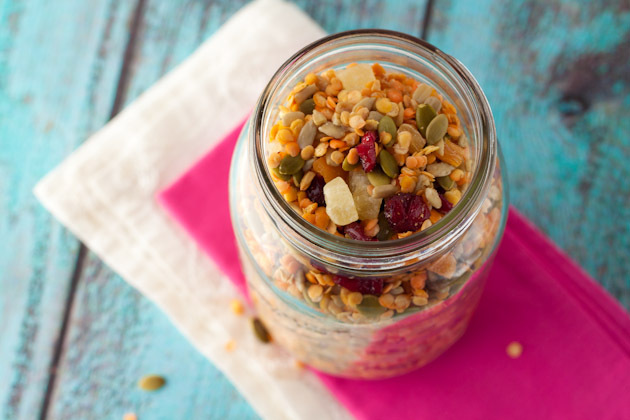 Lentils add a healthy dose of protein and fiber to this beach inspired healthy trail mix. It’s a snack anyone can feel good about eating! Soak lentils in 4 cups of water in a medium bowl for 4-6 hours. The longer you soak, the less chance the lentils will cause gas or bloating when you eat them. When the lentils are ready, preheat oven to 350F, drain and rinse them really well before spreading across a 13×9 rimmed baking sheet and sprinkling with salt. Bake in preheated oven on the middle rack for 30-35 minutes, or until lentils are crisp and crunchy. When complete, allow to cool to room temperature. Meanwhile, dice the dried apricots and pineapple chunks. Place in a bowl or on a large cutting board and add the rice flour, just a pinch at a time. Toss the fruit in the flour until the pieces are coated and no longer sticky where they’ve been cut. 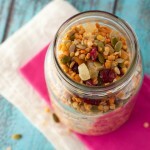 Mix lentils with remaining ingredients and transfer to an airtight container for your next day at the beach!